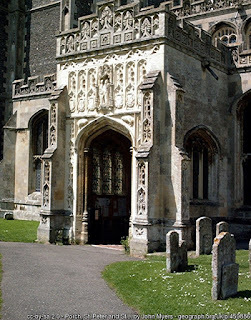 John Hammond and Agnes Garrold of Lavenham; Parents of Thomas Hammond, or were they? It fun to see how far back in time we can trace our ancestors. When the years roll back and I'm finding names in the sixteen century, I get really excited. However, when we get this far back, the caution light needs to be on. As records become sparse, it's easy to make mistakes, and relying on the family trees on ancestry.com is a big mistake. Genealogy, good genealogy that is, is fun, but make no mistake about it, it's hard work. Here is a great example of why you need to do your own homework. Two men named John Hammond married women named Agnes. Both families lived in the county of Suffolk in England. One couple were the parents of Thomas Hammond who married Rose Tripp, who children were the Hammond immigrants to New England. Do you know which John and Agnes were Thomas' parents? Agnes Garrold Hammond wrote her will in February of 1589, shortly before he husband died. She named in her will her children Thomas, John, Philip, Joan and her daughter Ann Sparrow. Her brothers Robert and John Garrold, named in her will, confirm her identity. 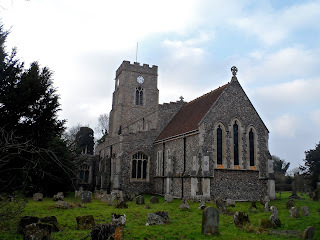 Agnes died in Lawshall and was buried at All Saints on 17 June 1591. This is the Hammond family of Lawshall. Frederick Stam Hammond, History and Genealogies of the Hammond Family in America, (Onida, NY, 1902), 35; image copy, Archives (https://wwww.archive.org/stream/historygenealogi11hamm#page/n103/mode/2up/search/Garrold : accessed 10 October 2015). Wills of both John Hammond and his wife Agnes Garrold Hammond of Lawshall, Suffolk, England as well as his ancestors. UK, FreeREG Parish Register Transcriptions: pre-1837," database, FreeREG (http://www.freereg.org.uk/cgi/Search.pl : accessed 26 March 2016), burial entry for John Hamond, 13 March 1588/9 [the elder of Salters] ; citing All Saints, Lawshall, Suffolk. Fredrick Stam Hammond, History and Genealogy of the Hammond Family, 39. Fredrick Stam Hammond, History and Genealogy of the Hammond Family, 35. UK, FreeREG Parish Register Transcriptions: pre-1837," database, FreeREG (http://www.freereg.org.uk/cgi/Search.pl : accessed 26 March 2016), burial entry for Agnes Hamond, 17 June 1591 [wid] ; citing All Saints, Lawshall, Suffolk.